The Impala is a medium-sized antelope famous for its grace and prodigious leaps. They are native to Africa, and are reddish-tan with a fairly distinct change to lighter tan on the lower side & white on the underneath. There are black accents and sometimes a patch on the forehead or nose. Their horns are long and slender with well-spaced rings. Only males have horns, which are typically 20 inches long, but have been marked as long as 35 inches. 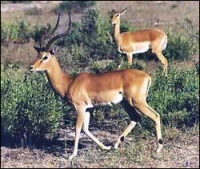 The average male Impala weighs 130 pounds, whereas females typically weigh 100 pounds or less. They are browsers and grazers, depending on the season. These animals enjoy open woodlands with water nearby. Gregarious in nature, Impalas become very docile in captivity. Their gestation period lasts six and a half months.